One Momma Saving Money: Boho Ponchos - Was $19.95 - Ships for $13.98! 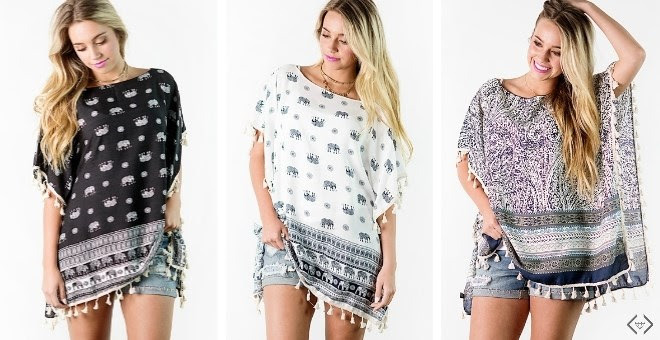 Boho Ponchos - Was $19.95 - Ships for $13.98! Shipping: $3.99 for the first item and $1.49 for each additional item. US only. Estimated to ship by Thursday, June 1. Sizing: One size fits most. Up to size 18. Lightweight elephant print boho chic poncho with fringe embellishment. Measurements: Width: 60", Length: 26 1/2"
Lightweight paisley boho chic poncho with fringe embellishment. Model is 5'4", size 2/4.